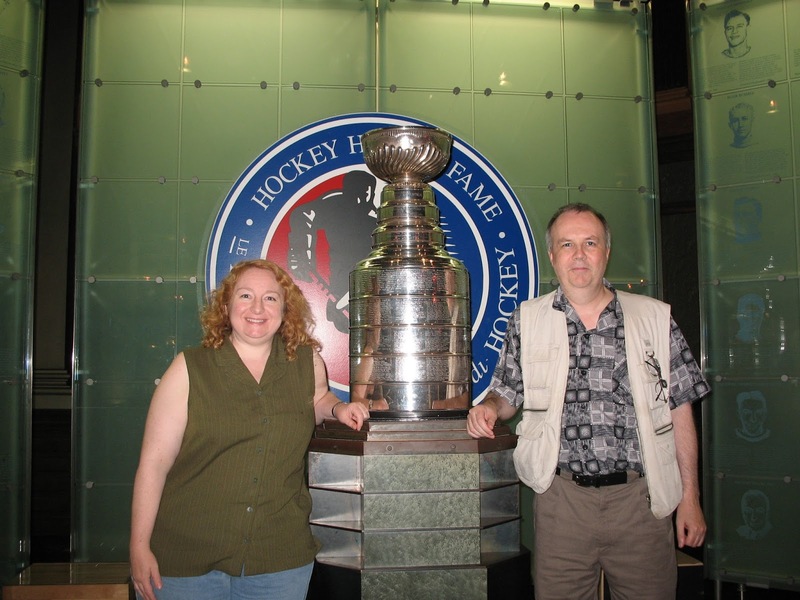 We had just arrived in Toronto that day and, as usual, Angelle had booked an awesome hotel. We were staying at the Hotel Victoria which is about the best location we could want in Toronto. After supper at a local restaurant about a block away I suggested that we take a look at the Hockey Hall of Fame. I did not think that it would be open but I just wanted to see the building and get an idea of where we would go when we visited it the next day. To our surprise the front door was open so we went in. Angelle pointed at the champagne glasses but I thought they must just be complimentary water because how could they afford to give out champagne to all the visitors. There was no one at the door so I thought it must be free to enter. 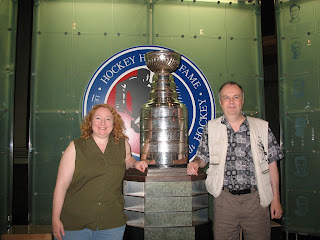 We walked around a bit and noticed a photographer by the Stanley Cup. He said that he was just packing up but he would be happy to use our camera to take a picture of us standing by the Stanley Cup. How could we say no to that? We got our picture and then wandered around some more. We were downstairs when a staff member came up to us and said that our limosine would be leaving soon. We looked at each other and light was beginning to dawn on marblehead. Maybe there was a special event taking place. We started to make our way out and another staff member came up to us telling us again that the limo was leaving soon. Angelle replied that we were going to walk since it was such a nice night. Not sure whose party we crashed but thank you very much and also to the staff and photographer. We came back the next day and bought quite a few souvenirs of our visit.